I was talking to a copywriter client last week about his website, which we are in the process of creating, and he happened to say hard it was writing his own words. I hear this a lot and it’s the same for me with my promotional work and this website. When you go public it’s scary isn’t it? We’ve made this mighty decision to say we’re selling or providing a service or product. We maybe be writing about ourselves, getting our photographs on Instagram or posting on Twitter, Facebook and other social media sites. We probably feel we have to be perfect before our views or content are released into the world. 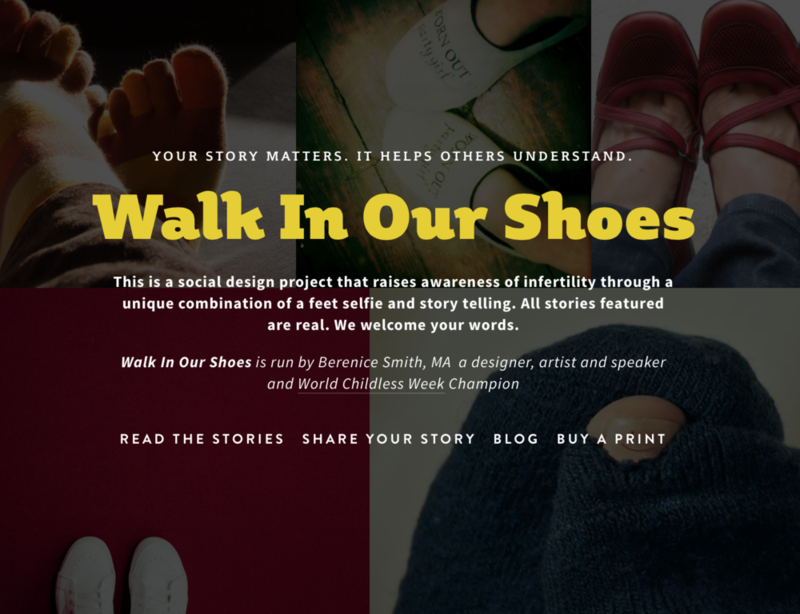 When I built the website for Walk In Our Shoes, I spent three months researching the subject matter in my Masters degree. I became well versed in the methodology. The detail was essential and the attention to typography mattered. Even after it was evaluated and marked, I keep tinkering with it before taking it to a new platform. In all it was about six months in all to finish it, not because it was a particularly difficult design project, but because subconsciously I kept delaying it. The power of hindsight and self reflection means it’s clear that I was scared to put the words and images out into the world. I’m still reluctant to bring the stories of my infertility and design together on this site for fear of imperfection. It makes sense - if your business is closely aligned with your most authentic self and purpose, then there's a vulnerability in sharing it. But there's also a beauty in being vulnerable. The people I most admire, the clients I love to work with and the brands I am attracted to are those who share themselves authentically and honestly. Often when we tell ourselves something isn't quite ready to be published, it just needs a bit more refining, or we just want to edit it for the seventh time, it's really the fear taking over. At Pecha Kucha Cambridge I remember telling a nervous speaker who worried about making mistakes in their talk, that only they would know what those mistakes are. At the next PK event I took that advice to heart when I tried to improv for the first time with 20 slides I’d never seen before. It didn't mean that the fears I had about perfection, were squashed forever, but it reassured me that audiences understand more than we think about mistakes because we’ve all made some clangers. We are very unlikely to reach the utopia when the website we’ve collaborated on or the 'about me' page we've created is 100 per cent pleasing or the book cover will sell thousands of copies (and unless we have clear goals, how do we know anyway), but if it's 80 per cent there, it's ready. Publish it. Otherwise we are just hovering in complete limbo feeling stuck. And actually, on the other side of hitting the button is the sweet relief of freeing up that headspace. We stop fretting and get a few 'likes'. Maybe someone comments that what we've created as meaning to them. We wonder what on earth we were worrying about. And the next time it comes to sharing something, maybe we're a little bit braver for the experience. Pecha Kucha Cambridge takes places on 20th March and you can find out about the speakers and venue here. I’m pleased to be part of the committee for this educational and entertaining event that connects Cambridge to the global PK network.